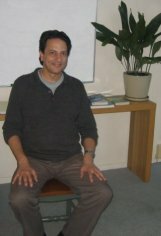 My name is George Gintilas and I work as an Energy/Body Psychotherapist in Melbourne Australia. I have been in private practice for 27 years. I work from and run the Elwood Centre for Wellbeing. This blog was set up to make available much more information to you than I can possible provide in my normal newsletter in the areas of your mental and emotional health and wellbeing. The information will be related specifically to your mind/body connection as well as your emotions and spirit, a true deep, holistic approach. The aim is to provide you with more education that can help you to EMBODY and HEAL yourself in much more efficient, fulfilling and complete ways than ever before. My work is based in Energy/Mindfulness/Body Psychotherapy. This is a powerful therapeutic modality and tool that can help assist you in many ways to take control of your life, rapidly improve your health and enhance your wellbeing more than ever before. I combine it with the very popular and effective P.S.H. Therapy as well as other therapeutic modalities I have trained in and have practiced for many years now. Join me here and be prepared and open for some great insights, learning and support that is very much needed in this day and age. The entries will be in regular bite sized portions, a digestible piece of information that won’t take too long to read, making it much easier to learn and integrate. Feel free to email anytime with any comments, questions or feedback.